Many people adopt pairs of kittens and puppies with the idea that multiple pets will keep one another company while their human companions are off at school or work. In some cases, paired pets are expected to mate. Most of the time, though, pets are just pals that may (or may not) come from the same litter. If it's tricky to choose a name for one pet, you'd think it would be harder to choose names for two. Luckily, though, there are all kinds of paired names ready for you to select. 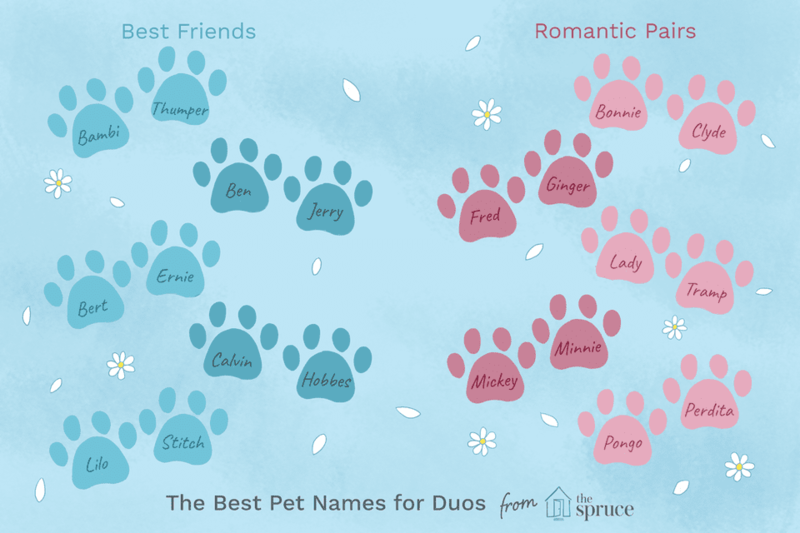 It's just a matter of matching the naming options to your pets' genders, relationship, and personalities. If you have a pair of animals that you're hoping to mate, it makes sense to give them the names of famous lovers. Here are some to consider; as you'll see, some are much sillier than others. Movies, books, and history are filled with stories about best friends. Even if your pets don't always get along, it can be fun to give them names that suggest they do. In this list, you'll find male/male, male/female, and female/female pairings. Separately your pets are incomplete, but together they rock. Choose names to represent their close ties by breaking one name or word in two. Some things are just natural pairs, and it's fun to find the perfect pairing for your pets. Here are some classic and not-so-classic options. They say that opposites attract. While that may not be completely true, they can certainly go together. Here are some cute opposites that make fun pet names, especially for animals that look or behave very differently from one another. What could be more fun than calling your pets by rhyming names? It not only flows off the tongue, but it also amuses the neighborhood kids. Here are some fun rhyming options.